Welcoming a new blog on the Internet from Julie Woodhouse Photography! Julie has now created herself a blog which I am sure you will want to have a look at. With it she not only showcases some of her wonderful photographs of Germany, but gives some interesting background to her excellent images of landscape and architectural subjects. Kicking off, she has some information about, and of course photos of, the delightful Neuer Garten in Potsdam right on Berlin's doorstep. Also, the fascinating history of modernist housing estates built in Berlin in the first half of the twentieth century, which are now UNESCO World Heritage sites: namely the Großsiedlung Siemensstadt and the Gartenstadt Falkenberg. If you thought housing estates had to be boring and grim places, then think again! 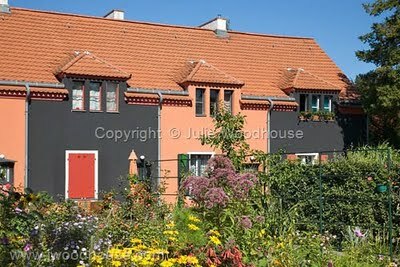 Above, for example, is a Häuserreihe (terrace of houses) on the Tuschkastensiedlung ('paintbox estate') at Falkenburg. I recommend the Julie Woodhouse Photography blog as a great place to discover a bit more about Berlin and Germany than you'll find on the well-beaten tourist trail, and eagerly look forward to more postings to come! NB you can click here to get an RSS feed of the latest Julie Woodhouse Photography blog posts to add to your own blog or newsreader. If you are not sure how to do this, then please contact me!